A child life specialist at the University of Florida Health Proton Therapy Institute (UFHPTI) discovered the need to educate her patients prior to their arrival in the Jacksonville area, but she didn’t know how to develop an accessible and digital teaching tool. 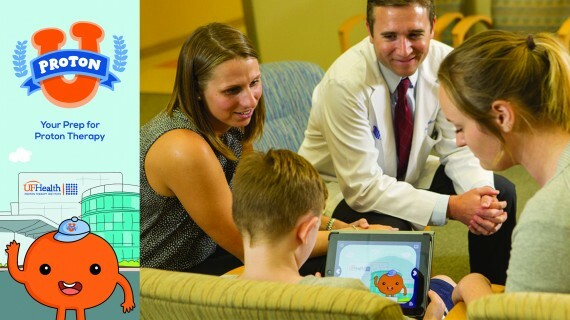 UFHPTI partnered with Flagler College and a mobile developer to create Proton U, a kid-friendly mobile application for pediatric cancer patients and their families to learn about their upcoming treatment. The design team also developed a suite of interrelated products to support interaction at multiple touchpoints and create a holistic service experience for children. This included a storybook and micro-site to interact with at home, and a plush toy and life-sized cardboard cutout of the app’s main character to display in the lobby and welcome patients to the institute. Proton U was designed primarily for pediatric cancer patients, ranging in age from 18 months old to 18 years old, who will be coming to Jacksonville, Florida from other states and a variety of countries, including Great Britain, Norway, Peru, Saudi Arabia, Pakistan, China, Nicaragua and Australia. The medical team at UFHPTI will incorporate this into their active pediatric program, which dramatically improved the rates of children requiring daily anesthesia for treatment – dropping from 94% to 50% in children age five to seven. Through ‘playful learning’ and storytelling, Proton U will equip young patients with information and coping skills that may reduce anxiety and fear during a stressful time in their lives. It will be used by the only proton therapy center in the Southeast U.S. that also has one of the largest pediatric programs in the world. UFHPTI has relationships with the British National Health Service, the Régie de l’assurance maladie du Québec and the Norway Health Authority, serving as the primary referral center for certain proton treatments. Patients and healthcare professionals from around the world will be able to download the cross-platform, multilingual, free mobile app. The project, which started during the fall semester of 2014, presented Flagler College students with a complex social problem that required knowledge, skills and talents from multiple disciplines across campus. The approach taken was organic and pragmatic. It allowed students to apply what they were learning in the classroom to meet a real need in the community. During a field trip, the class visited the institute to learn about proton therapy, tour facilities and conduct user research, which involved conversations and activities with pediatric patients and their families. After research, the group worked together to establish the creative direction for the app—one that was educational, appropriate and engaging. Students applied for various roles, including branding, interface design, illustration, content development and user experience. During the spring semester of 2015, students focused on finalizing the UX/UI design of the mobile app and creating other products. Students from theater arts and communication volunteered to create character voices and record audio. After learning that many patients are non-English speaking, Spanish and Norwegian students translated content to make it more accessible for international patients.